I just logged into Yola and I see the brand new look. Wow! Good job guys, it looks great! Will the drop downs change too? They don't really match the blue anymore. I also really like the new links in the top left corner. I like how it shows our email now for options and how it has the "New Features" link. That is a nice little thing to show us new features! I actually like the new blue, especially with the gradient. I don't know if pink would look good on the site builder. It would be great if there's an option to pick the color we want — that way everyone can have the look and feel that they like. I to like the new look but would prefer the log out to be a bit more prominent, maybe a button on the menu bar. I can see that the Site Builder does not use much JQuery still. 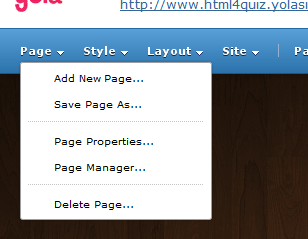 I know the Yola SiteBuilder Developers know JQuery and it would be nice to have more animation. (slideDown, fadeIn, animate ect). Anyways, like the new style and more customization would be pretty cool. The blue is nice, but I think it stands out too much from everything else, such as the widget collections. I like the 'New Features' link, so you can always be up to date with the sitebuilder. I agree with Parthiv as well! Thanks everyone for continuing to share your input on our new look!. We do appreciate it! I agree that the blue is highly saturated compared to the general white UI that Yola has (And which I like). I really liked the previous silver gradient. I think that was more subtle and clean. I like the fact that the toolbar now has more emphasis, and I'm sure that will be most useful to new users especially. I agree that a more prominent Log Out button would be really nice. I think that if the plan is to stick with the blue currently being used, other UI elements need to match as Nathan said. Other than that I like changes. I'm glad Yola stays fresh, bringing us new features and a general breath of fresh air occasionally, but without changing things too much and making things unfamiliar. Thanks for your feedback Brandon :) We appreciate it.